September | 2011 | What Next? Last weekend we celebrated my Aunt Mary’s 80th birthday. Aunt Mary is my Dad’s younger sister and she came to Manitoba from her home in Arkansas for a visit. 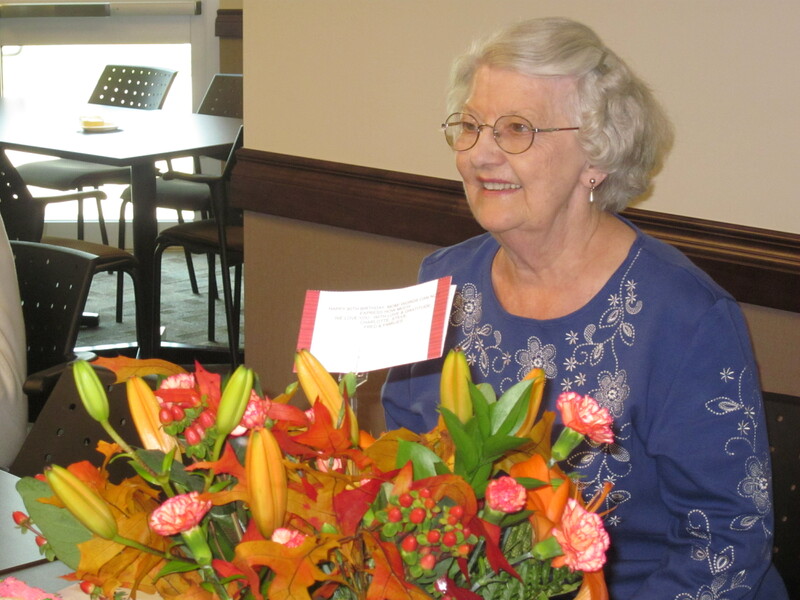 Her four sisters and brother who live in Manitoba decided to surprise her with a birthday party. Her children flew in from Oklahoma and Minneapolis and nearly fifty members of our extended family turned up at her party. That is not surprising because Auntie Mary is a very special lady. She lived in Newton Kansas for many years and that was where the Mennonite Church had its headquarters. My son Bucky wasn’t even a year old when I went there for a Parenting For Peace and Justice workshop. Auntie Mary invited me to stay with her and volunteered to care for my baby while I was at the workshop sessions. Bucky had a wonderful time with her. When Dave and I, and our two boys, were on our way to the Hopi Indian Reservation to do voluntary service for a year in a Mennonite Mission School there, we had to stop in Newton for a week of orientation. Again Auntie Mary offered her child care services and planned a week of non-stop activity and excitement for her two great-nephews while Dave and I were busy with meetings. She even made a photo album for Bucky and Joel cataloging all the fun things they had done together in Newton. Auntie Mary is a nurse and for many years she was the manager of her husband’s medical office. Uncle Herb is a retired surgeon. But she still found time, while raising three children, to go back to university and get a degree in art. Dave and I have a beautiful painting of hers hanging in the front hallway of our home, a wedding gift from Auntie Mary. Auntie Mary is an avid reader and I remember that on the occasions I have visited her home, she always had a stack of books she’d read placed on the night table by my bed. These were books she had selected from her personal collection especially for me because she thought I would be interested in them. When I was born my Auntie Mary stayed up all night with my Mom. 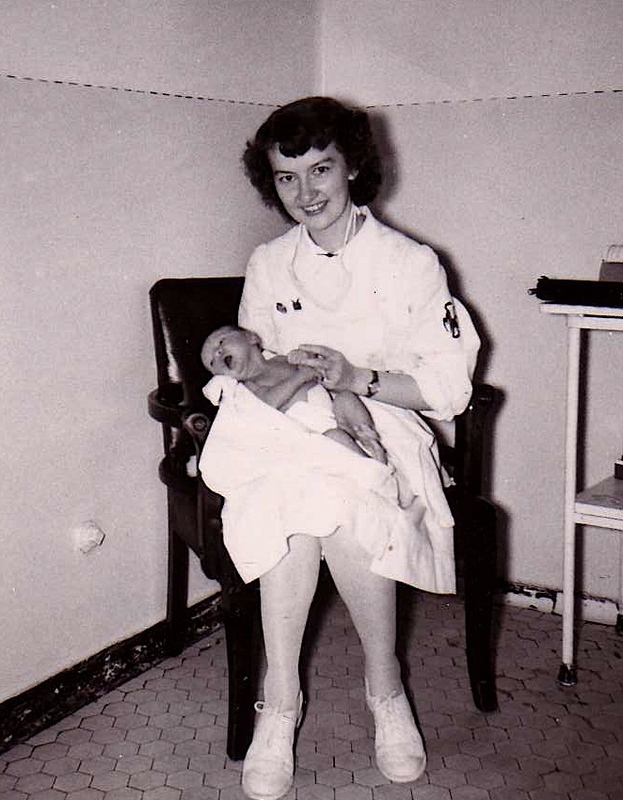 This was before the time when husbands were allowed in the delivery room, so my Aunt Mary was my Mom’s support as she labored through the night to give birth to her first child. Auntie Mary was writing her final exams to become a nurse the morning after I was born, but despite that she stayed awake all night with my Mom. In this photo she is holding me just after I entered the world. It is no wonder my mother and father decided that at least part of my name should be a tribute to Aunt Mary. On our recent trip to Ukraine I took along the transcribed notes my Auntie Mary had given me of several lengthy oral interviews she had conducted with my grandparents about their life in the Soviet Union. Those notes are what made it possible for me to find the places where my grandparents and great grandparents had lived. I read my grandparents’ stories as I walked through their home village of Gnadenthal, and their life there came alive for me because of the work Auntie Mary had done collecting and transcribing her parents’ stories. Auntie Mary is a warm, compassionate, positive person, family orientated, hospitable, easy to talk to, affirming and a life long learner. I am proud to be her namesake. My husband Dave has always had a movie buddy. Movie buddies are guys he can call at a moment’s notice and they willingly head off to whatever show Dave wants to see. Dave is a bit of a movie junkie and really doesn’t mind going to any film. I am a little more fussy about the films I watch and I often have other things I’d rather do than see every movie that comes along. When we lived in Steinbach, before moving to Hong Kong, Brian was Dave’s primary movie buddy for many years. Brian was young, a golf professional and often agreed to hop in the car with Dave and drive to Winnipeg for a late movie. The two of them would catch a 9:45 show and then get back to Steinbach after midnight. I was so grateful to Brian for going to all those movies with Dave. It meant I could go to bed at a reasonable hour and escape movies that I really had no interest in seeing, but might have gone to, because I felt sorry for Dave having to go to the theatre alone. Dave had back-up movie buddies as well. I remember David, a local lawyer who also accompanied Dave on his late night movie escapades at times. Eventually David and Brian both got married, and then had children, so their availability for movie adventures wasn’t what it had been in the past. Luckily we moved to Hong Kong where Dave was able to find a new movie buddy. Bill lived in the same apartment block as we did in Ma On Shan and was a fellow teacher at International Christian School. He was as passionate a film buff as Dave, and so the two made an excellent movie pair. Dave could call Bill just about any time and he’d be ready and willing to meet Dave in our apartment lobby to set off on a visit to the theatre at the local mall or even a movie house further afield in the city. I know Bill’s wife Yasuko was every bit as grateful as I was that her husband had a movie buddy. Yasuko is very discerning about the films she watches and was only too happy that Bill had a companion to go to movies she had no desire to see. She often thanked Dave for being Bill’s movie buddy. Now Bill and Yasuko have moved to Hawaii and we are in Winnipeg. Once again Dave is in need of a movie buddy. There are several movie theatres within easy walking distance of our condo and Dave could go to a movie every night if he wanted to. The problem is I don’t want to. I’m a little bit of a coward when it comes to watching movies with too much violence and I’m not a fan of lengthy foreign films that are all about great cinematography and have little story line. Besides right now I’m finishing a history book project that has a deadline looming and so I feel guilty watching movies when I should be working on it. What next? I’m taking applications for a Winnipeg movie buddy for my husband. You need to have a somewhat flexible schedule and be spontaneous enough to agree to seeing a movie with very little prior notice. You need to be a fairly devoted movie aficionado, willing to see almost anything just for your love of the silver screen. If you are interested please respond to this blog post and I’ll pass your name along to Dave. 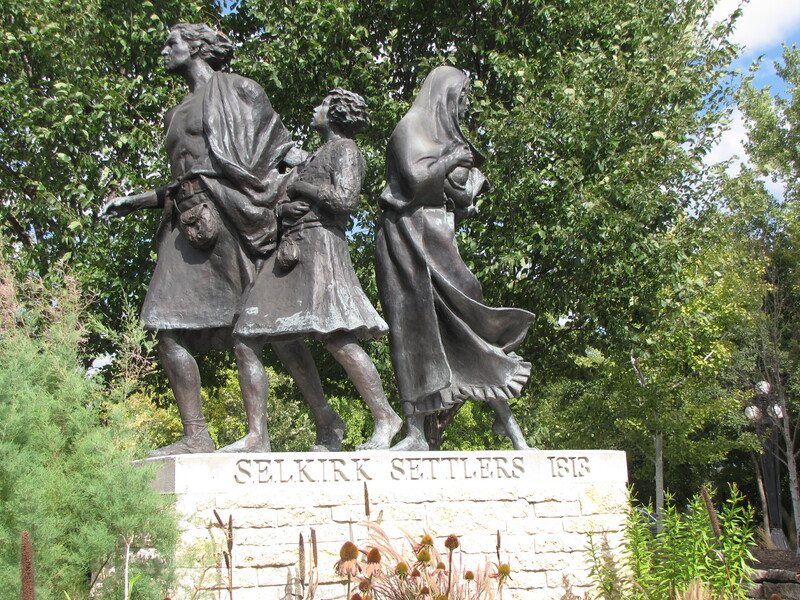 There is a statue at the end of our street at the corner of Bannatyne and Waterfront Drive called Selkirk Settlers 1813. It was created by Gerald Laing and depicts a family of four departing Scotland for a new home in Canada. 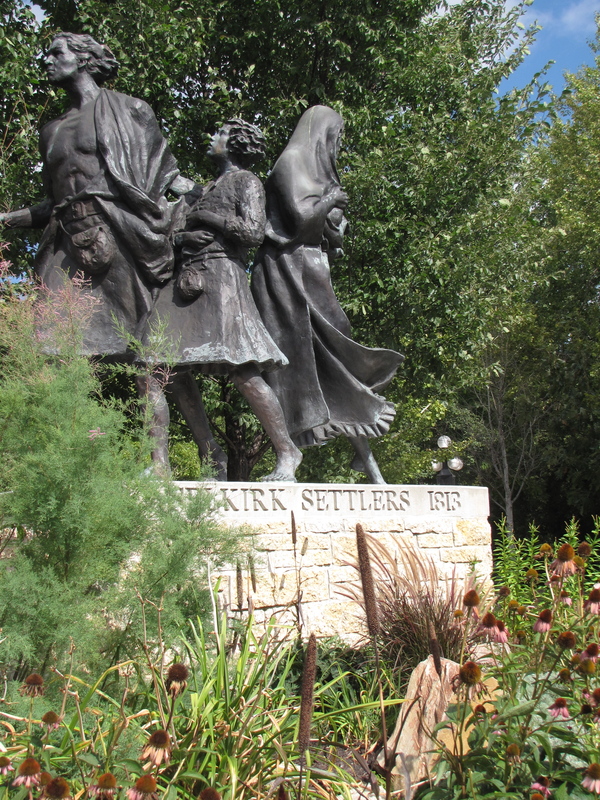 A sign near the statue explains that in Scotland in the late 1700’s and early 1800s many men, women and children were chased off their land and burned out of their homes. Some were sold into slavery and others were put on ‘coffin ships’ that went to destinations all over the world. They were called ‘coffin ships’ because the accommodations on board were so horrible—little food, water or living space so as many as 30% of the passengers on board these coffin ships from Scotland died. They said sharks followed the ships waiting for the bodies to be thrown overboard. Rich Scottish landowners wanted to use more of their land for raising sheep so they cleared off all their tenants. This came to be known as The Clearances. A humanitarian named Lord Selkirk arranged for some of the people who were victims of The Clearances to come to Canada and establish Scottish colonies here. 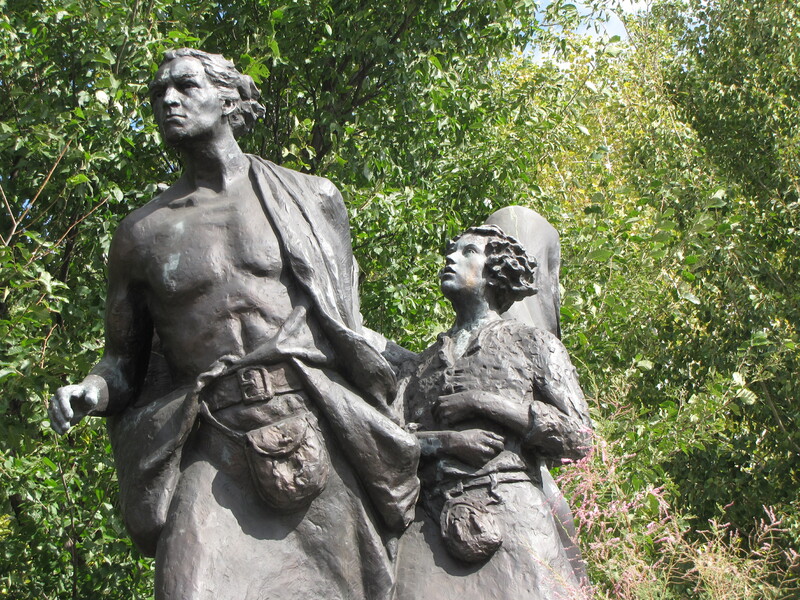 The statue represents some of those Scots who came to settle here in Manitoba. The Dad has a bare chest and is wearing his kilt. He looks very resolute and hardy. His son is looking up to him. They are facing forward ready for the dangers and challenges ahead. You can see that the Dad has a guiding hand on his son’s back. The mother whose shawl and dress are being blown around by the wind is looking back at her homeland before leaving. She is probably wondering if she will ever see it again. She appears more apprehensive about embarking on an adventure to an unknown place. Perhaps she is leaving relatives and friends behind. The men’s feet are moving forward. The mother has pivoted on her foot to look behind. The mother is holding her baby tight to her chest, no doubt worried about what the future will hold for her small child and whether the wee thing will survive the long voyage to Canada. The first 23 settlers from Scotland brought a bushel and a half of wheat with them which they planted in the agricultural settlement that would eventually become the City of Winnipeg. 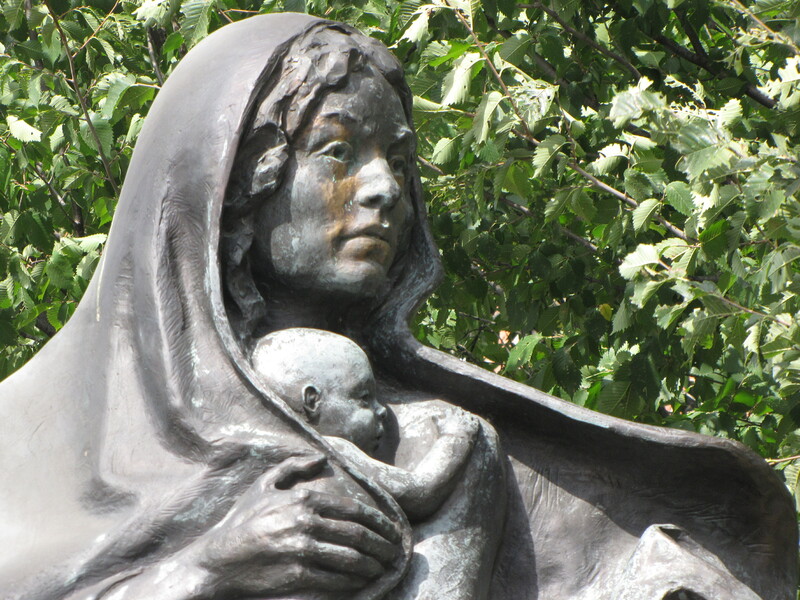 Some people call this statue The Exiles because the people had been exiled from their homeland. I walk by this statue almost every day and it reminds me of my own grandparents who were also exiles—forced to flee Ukraine in the 1920s after all their land had been taken away, their possessions stolen and their lives placed in danger. Canada is a country filled with people who were exiled and made their way here to start a new life. This statue was erected in 2008 thanks to generous donations by Dennis MacLeod and John Webster two Winnipeg Scottish businessmen. I’m grateful to them for adding this thought-provoking and beautiful piece of artwork to my neighborhood. 1. Thompson is a modern up to date place, with paved roads, nice houses, apartment blocks and every kind of store and restaurant you’d see in any other North American city. Boston Pizza, Wal-Mart, Canadian Tire, McDonald’s, Pizza Hut, Shoppers Drug Mart—they have it all. 2. Thompson has a large immigrant population. My two taxi drivers were both from India. One had lived as an illegal immigrant in Boston for a while but decided things would be safer in Canada. The cleaning lady at my hotel was from the Philippines. I went for lunch at a restaurant owned by a Chinese couple from Harbin, a city way up in northern China. I always wanted to visit Harbin when I lived in China, because they have these world-famous ice sculptures in winter. I chatted with the proprietor briefly and she told me the weather in Thompson is much like the weather in Harbin, which is one of the reasons they chose to move there. 3. In summer time there are quite a number of homeless people living on the streets in Thompson. They come down to the city from more isolated, northern communities, live on the street in Thompson while the weather is nice and when it turns colder they go back to their home communities for the winter. 4. There is fairly good air service to most northern communities so people are able to fly out when they need to. Medical service is provided by local nursing stations, home care workers and community health workers and in some cases doctors from France who are flown in regularly to rotate through northern communities and see patients. 5. There are three options for instruction in Thompson schools. Students can take classes in English, French or Cree. You can even go to university in Thompson at the University College of the North. 6. Thompson was named after a person—J.F. Thompson a metallurgical genius who was instrumental in the discovery of nickel near Thompson and was president of the INCO company in 1957 when they struck a deal with the Manitoba government to establish a planned community in the north. I saw this clock with Thompson’s name under it as I was driving to the airport. 7. The people I met in Thompson were very friendly—from the kind manager of the Boston Pizza franchise who went out of his way to return my credit card when I forgot it there after my supper, to the nice gentleman who checked me in at the Suburban Hotel and answered all my questions, to the welcoming people at the Keewatin Tribal Council who made me feel right at home. What next? I think I may need to go back to Thompson again and spend more than 21 hours there next time. I wasn’t happy when I boarded my Calm Air flight to Thompson yesterday. It was pouring rain in Winnipeg and I had to walk a long way across the tarmac to the plane, so by the time I boarded I was soaking wet. You don’t get assigned seats on Calm Air, you just sit wherever you like, so I sat down in the first empty seat I came to—beside a very elderly man. I apologized for dripping water on him, asked if he could move his bag to make room for my briefcase and started to chat about the weather. He didn’t reply and then I noticed his hearing aid and wondered if he’d even heard me. I decided getting to know my seat mate which is something I usually like to do, wasn’t in the cards for this flight. I was sleepy after spending a good part of the previous night at the hospital with my Mom so I decided to have a snooze. When I woke up the elderly gentleman beside me was reading some notes and holding a blue folder labeled SPEECH. I didn’t mean to look, really I didn’t, but the notes were in huge print and my eye caught something about the Aspers, who are media moguls here in Canada, and apparently the man sitting beside me , who referred to himself in his speech notes as ‘an ink-stained journalist’, had discussions with Izzy Asper, the head of the family, about his reluctance to allow his children to inherit his business. At this point I started to realize the man beside me was someone well-known, but I just couldn’t remember his name. The hat he was wearing looked familiar too and I knew I’d seen him wearing it in a photo in a newspaper byline. But his name wasn’t coming to me. The stewardess served us drinks and when the man dropped his bottle of cranberry juice on the floor he asked if I might pick it up for him so I did. The flight was short and by the end of it the man’s name still hadn’t come to me. Remember I’ve been out of Canada for four years and haven’t been reading Canadian newspapers. I finally thought of his name when I was in the cab on the way to my hotel. “That was Peter C. Newman and I’ve seen his photo in Macleans magazine!” But what in the world would Peter C. Newman be doing in Thompson of all places? As soon as I got to my hotel I googled him and sure enough Wednesday morning Peter C. Newman was speaking at a Manitoba Community Futures breakfast in Thompson. I could have kicked myself. Here I was sitting beside one of the most famous Canadian journalists ever, for an hour and a half plane flight, author of over twenty books and editor of both the Toronto Star newspaper and Macleans magazine and all I talked to him about was the weather and cranberry juice. What next? I doubt I’ll get a chance to meet Peter C. Newman again but if I do I’ll certainly know exactly who he is! I’ve been working on a presentation I’m giving in Thompson, Manitoba tomorrow and one of the things I’m going to talk about is how to say “no” to people when they ask you to do something. I plan to provide a set of guidelines for helping people to learn to say “NO”. Guideline #1 —Wait for people to ask you to do something before you offer to do it. They may not really want your help because it implies you think they can’t manage on their own. If they truly want your help they will ask. Guideline #2— Don’t reply right away. Tell who ever is asking you to do something that you need a little time to think about their request and you will get back to them. This gives you the opportunity to weigh pros and cons and make a wise decision. Guideline #3 —Be sure your body sends the same message as your voice. Move away or turn away from the person asking you to do something if you feel you need to. Keep your head up. Look the person in the eye. Add a related hand gesture if you feel you need to. 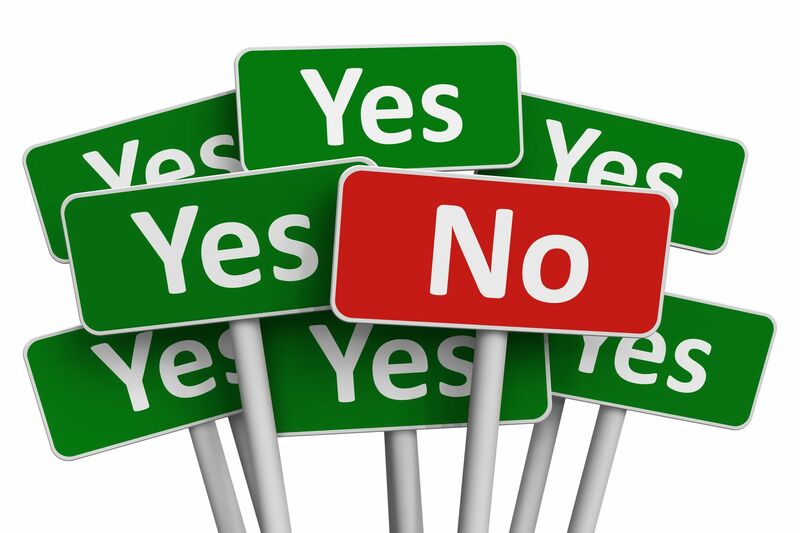 Guideline #5 —Be prepared to state your “no” repeatedly. Be like a broken record repeating your message till the other person gets it. Telemarketers say they aren’t allowed to hang up till the person they are soliciting has said no three times. You don’t need to rephrase your no each time- just restate it. Guideline #6—Be your own advocate. You don’t need to feel you need to help with a project a colleague or another family member has agreed to if you haven’t agreed to it as well. You are not responsible for helping them meet their own commitments. Guideline #7—The person asking you to do something may not like or appreciate your “no” but that’s their business, not yours. If they are angry they can deal with it. 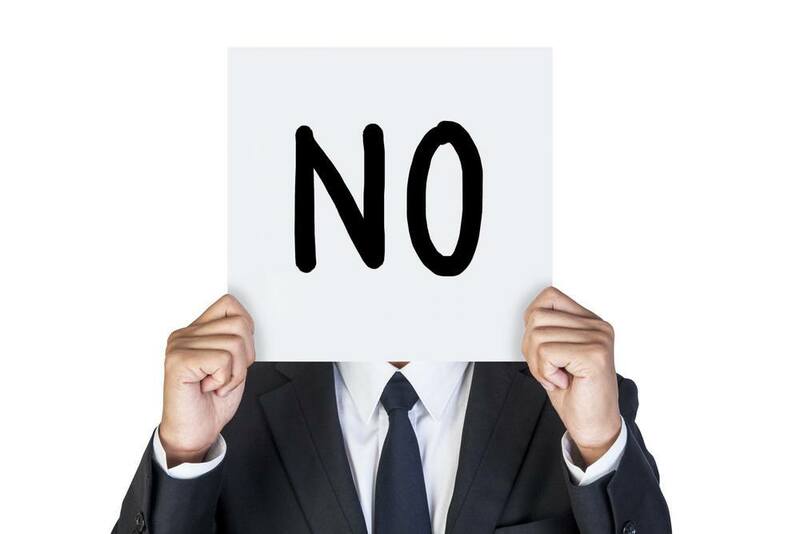 Guideline #8- Practice saying “NO”. Actually stand in front of a mirror and rehearse your assertive “NO”. If you realize ahead of time you may soon be in a situation where you might be tempted to agree to something you’d rather not do, get a friend to role play the scenario with you and practice saying no. What next? I need to adhere to these guidelines myself so the next time I’d rather say “NO” but I feel compelled to say “YES”, I’ll be prepared. 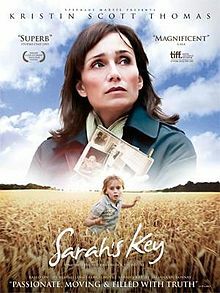 I read Sarah’s Key on our drive home from Ontario earlier this month and so when the movie version opened here in Winnipeg I was anxious to see it. In both the book and the movie I was engaged by the story of young Sarah Starzynski, who locks her little brother in a closet in order to keep him safe when the French police, working in cooperation with the Nazis, come to round-up the rest of her family. Sarah and her parents are taken to a Paris sports arena and held captive in inhumane conditions with thousands of other French Jews. Eventually most are sent to concentration camps and killed. Sarah’s little brother is left to die in the closet, but Sarah, who manages to escape from a transit camp thanks to the kindness of a French police officer, hangs onto the closet key always hoping she will be able to go back some day and rescue her brother. The movie and the book however are actually telling two stories; Sarah’s story and that of Julia, a modern-day American journalist who uncovers the truth about what happened to Sarah and her family while doing research for an article. Julia’s storyline documents how she deals with a difficult marriage and an unplanned pregnancy. Julia’s personal life was too much like a soap opera for my liking. Although Julia has problems, they seem almost trivial when juxtapositioned with the life and death ones Sarah is facing. The ending to Julia’s story feels contrived and melodramatic when compared to the tragic, but harshly realistic end to Sarah’s story. Despite this I liked both the film and book and made a number of personal connections with them. Julia says in the movie that she felt compelled to write about Sarah’s family because ‘if a story isn’t told it is forgotten.’ This reminded me of a visit I made to Yad Vashem, a Holocaust museum in Jerusalem. I was chaperoning a high school trip to Israel with 24 of my Hong Kong students. As you walk from room to room in the museum you hear stories being told in first person, by Holocaust survivors. If you care to stop and listen, you can hear dozens and dozens of people describing their tragic experiences. We had not alloted nearly enough time for the museum since our students were so drawn in by the stories they wanted to listen to them all. I remember two in particular that I listened to. A woman said when she was six years old, Nazi soldiers knocked at the door of her home and her mother hid her in the coat closet before answering the knock. The mother asked the soldiers if she could get her coat to take with her, and when she opened the closet door to retrieve it, she whispered to her daughter, ” I love you.” The girl never saw her mother again. In another story a woman described the agony she went through deciding whether to have an abortion because she did not want to bring a baby into the world only to have it die in a concentration camp. 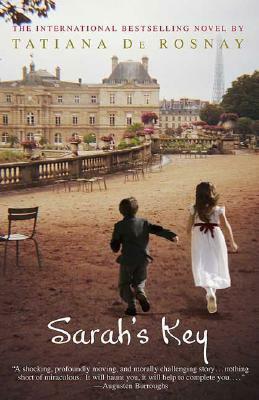 Sarah’s story in Tatania de Rosnay’s book is like the ones I heard at Yad Vashem. As my teenage students stood and listened to those stories I saw tears trickling down many of their faces. Although thousands of Jews were arrested by the French police who were aiding and abetting the Nazis,there were also French citizens who protected the Jews. An elderly couple in the story risk their own lives to save Sarah and her friend and end up giving Sarah a home and raising her to adulthood. 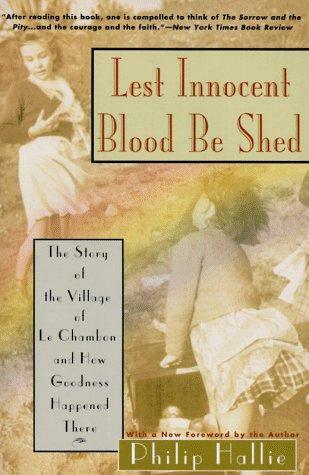 Over 20 years ago I read the book Lest Innocent Blood Be Shed and I have never forgotten its story. It is one I have shared with many of my students. The book is about a small Protestant French village called LeChambon. At the urging of the village pastor Andre Trocme, the people of the village band together to shelter and facilitate the escape of some 3,500 Jews, mostly children whose parents had been sent to concentration camps.The entire village was dedicated to the cause and throughout the war not a single villager ever betrayed a neighbor. I was also impressed that the villagers were committed to helping the children maintain their Jewish faith rather than trying to convert them to Christianity. Like the elderly couple in the film, there were many French citizens who despite great personal danger to themselves, saved the lives of their Jewish neighbors. Although Sarah grows up to be a beautiful young woman who eventually marries and has a child of her own, she never gets over the catastrophe that befell her family and it has tragic consequences in her own life. I think she always felt guilty about locking her brother in that closet. If she hadn’t, might he have somehow escaped and lived like she did? 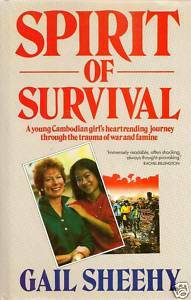 The first book I ever read by Gail Sheehy was The Spirit of Survival. It tells the story of a young Cambodian girl named Mohm whose family is killed during the brutal regime of Pol Phot and the Khmer Rouge. Mohm walks to a refugee camp, surviving unbelievable horrors as she does so. Author Sheehy meets her in the camp and adopts her. She raises Mohm to be a bright, happy, successful young woman. In the book Sheehy explores why some Cambodian children who survived the Khmer Rouge became strong people, while others could never get over the tragedy they experienced and had troubled lives. They always felt guilty they had survived and their families had not. Sheehy tries to define that spirit of survival. I think Sarah in Tatiania de Rosnay’s book had that spirit as a child but not as an adult. My family has been involved with helping quite a number of refugees from war torn countries settle in Canada and I have noted that even within the same family, some people find it easier to put their past behind them and move on,while others understandably struggle mightly to live with the tragedies of war they have experienced. Julia, the journalist researching the French Holocaust, played by Kristin Scott Thomas in the film, becomes completely engrossed in Sarah’s story, in fact it seems at times she is almost obsessed by it. She even goes so far as to name her new baby daughter Sarah. I think I would have found this unbelievable, if the same thing hadn’t happened to me. Many years ago I wrote the life story of a woman named Anna Shilstra who was one of Canada’s first female doctors. In the mid 1900s she lived and worked in Steinbach, the community where I grew up and lived most of my life. I interviewed dozens of people who had known her and I became so immersed in her story during the weeks I spent researching and writing it, that I began having dreams at night that I was her and was living her life. I always encouraged my English students to find personal connections with the materials they read in order to make them more meaningful. If you’ve read Sarah’s Key or seen the movie I’d love to hear your personal connections.